Are you taller than average and you need your shower head mounted extra high? Is your plumbing on an exterior wall meaning the wall needs to be framed out extra deep so the pipes don’t freeze? Would you use a pot filler? What about an island prep sink? Does your garage need a warm water spigot for washing your dog? There’s a lot of custom plumbing related questions we ask when designing your custom home. 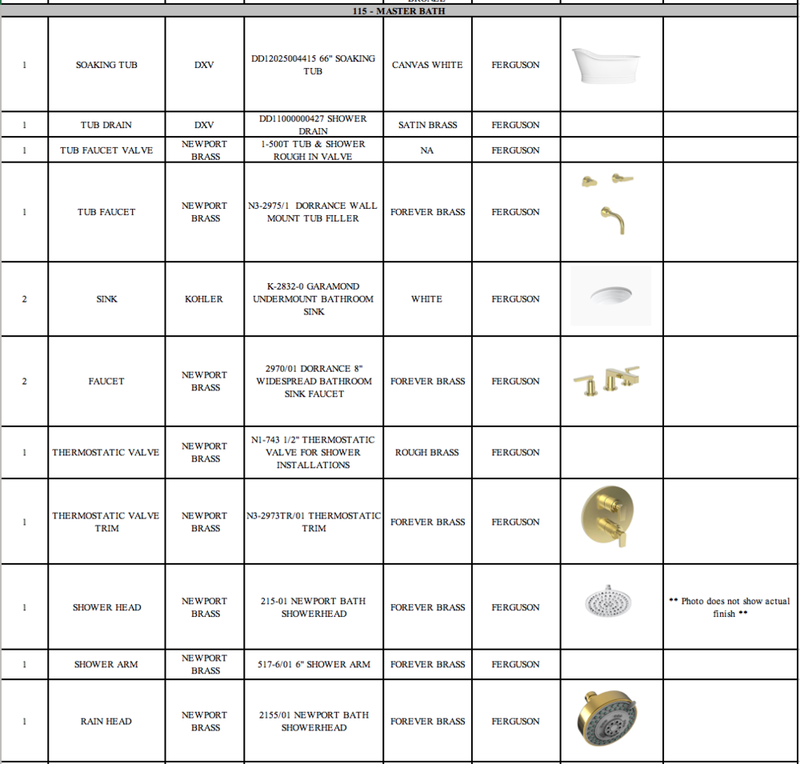 After selecting all of the plumbing fixtures, we put together a Plumbing Schedule and Plumbing Diagrams. These help the builder order the correct finish, style, and quantities, and the diagrams show the plumber how to install them. You’ll notice, we even spec things like drains, rough in valves, and toilet trip levers because details matter - no matter how small. These diagrams are important to have completed before construction starts. Shortly after your home is framed, the plumbers come in and do all of their in-wall plumbing. This happens months (sometimes a full year!) before you ever see decorative fixtures installed. It’s important for the plumber to know where to place drains and if faucets or through the floor or in-wall. What components are in the shower? If you have an island with plumbing in it, the cabinetry layouts need to be done because they will place plumbing in the floor long before the cabinets are in. But don’t stress - that’s why we’re here. We’ve got you covered!